All lean-to greenhouse kits are currently on sale. Please call 1-800-665-2124 for your free quote! All Pacific Series lean-to's have curved eaves. Not only is this quality lean-to greenhouse kit an architectural delight, it is sure to create a stunning focal point in any garden setting. This Pride of the Pacific lean-to has curved eaves and is designed to attach to an existing wall. It offers the maximum natural light for year-round greenhouse gardening. 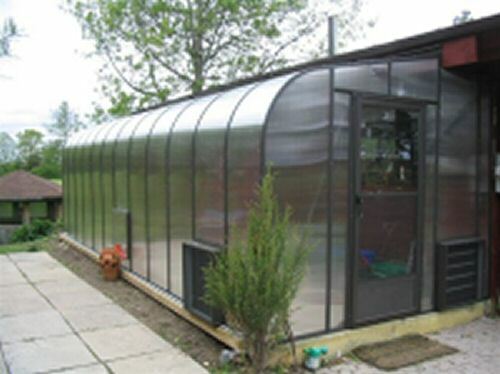 The twin wall polycarbonate lean-to greenhouse offers both beauty and durability.